In the beginning…..there were chocolate chip cookies! 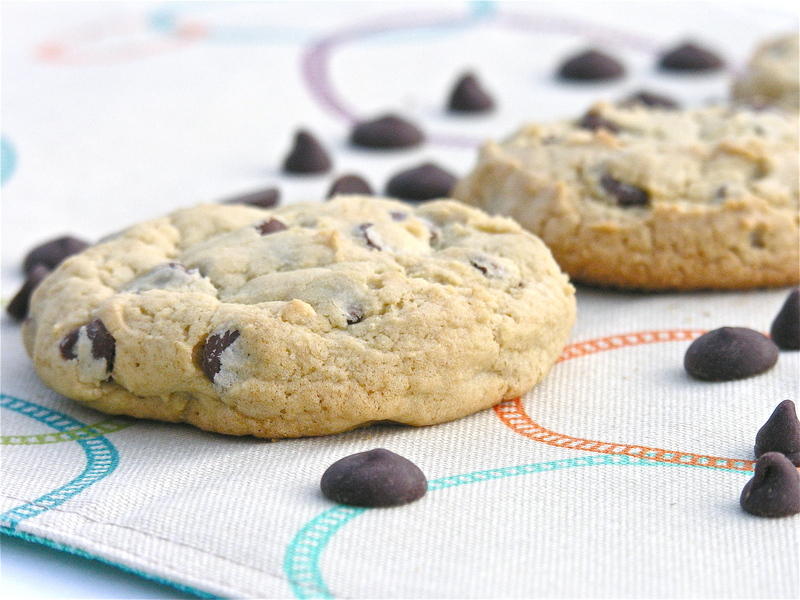 Everyone needs a great recipe for chocolate chip cookies. For big chewy perfect-every-time goodness this is your recipe! Cream together butter and sugars. Add the rest of the ingredients except for the flour and chocolate chips. Add flour (batter will be fairly dry). Fold in chocolate chips. Drop using a Large Cookie Scoop onto cookie sheets. Bake at 350 degrees for 12-14 minutes. Posted in Cookies, Easy recipes and tagged chocolate, chocolate chips, cookies, dessert, sweet. Bookmark the permalink. Is this your recipe for those wonderful choc. chip cookies that you make? This is the only chocolate chip cookie recipe I ever use 🙂 It’s my favorite! My catering company has made thousands of these cookies, with some minor alterations, i.e., butter instead of margarine, but otherwise, very similar. There is one other difference that I won’t divulge as it has been a fairly well kept secret for us. The other thing is to make sure to undertake them!! Yum! Well now you have me so curious! Butter never works for me in this recipe- the cookies turn out flat instead of cake-like. I bet your customers are SO excited to get such yummy cookies from a caterer though! Nice to meet you! Love that pie looks so cool. Are you planning on adding a google connect bar to your blog. That is my favorite way to stay connected and follow. No pressure just a suggestion. Love the name of your blog too. this is my go-to chocolate chip cookie recipe. so darn delicious and everyone loves them!!! You rock! Ruthie, how many cookies does one batch make? It depends on the size of the scoop you use Noel. If you use a large cookie scoop (about the size of an ice cream scoop) it makes about 28-30. Smaller scoops will give you more. 🙂 You’ll have to let me know how they turn out!! If I remember right they were gone by lunchtime, I am going to make them again this Sunday for our week of grazing before school is out. Fixed these last night and they were a great hit with my family and friend’s. Makes plenty and not too sweet. I added in white chocolate chips too. Baked up nice, thick and didn’t fall flat! Will use this recipe a lot! Are these chewy or puffy? They are cake-like rather than chewy or even crunchy…. Disappointed! They are very cakey. I missed the butter taste and the crunch of some walnuts. Would not make these again, but I do love your site and see many other dishes to try! So sorry you were disappointed!!! These are very big chewy cake-like cookies. You could add nuts, but they will never be a crunchy cookie recipe….if you like chocolate and coconut together click here for a truly crunchy cookie–I usually prefer cake-y cookies, but I love these!!!! Thanks for your feedback! These are Amazeballs! I have used the same chocolate chip cookie recipe for many years and these baked up so much better and I like that they were cake like! Everyone at work kept asking me why I don’t open a bakery because these were so big, round and perfect! Only think I did different was use half butter/half margarine. Thanks for the great recipe! I’ve been told I should open a bakery based on these cookies too- lol! They re my favorite cookies! These cookies are AMAZING! I have baked about 5 batches since finding the recipe and without fail they are loved by everyone who sinks their teeth into them….I have a question regarding these cookies, are they good to make ahead and freeze? If so, for how long? And the same question applies about your Caramel Fudge Brownies…can these be frozen as well? 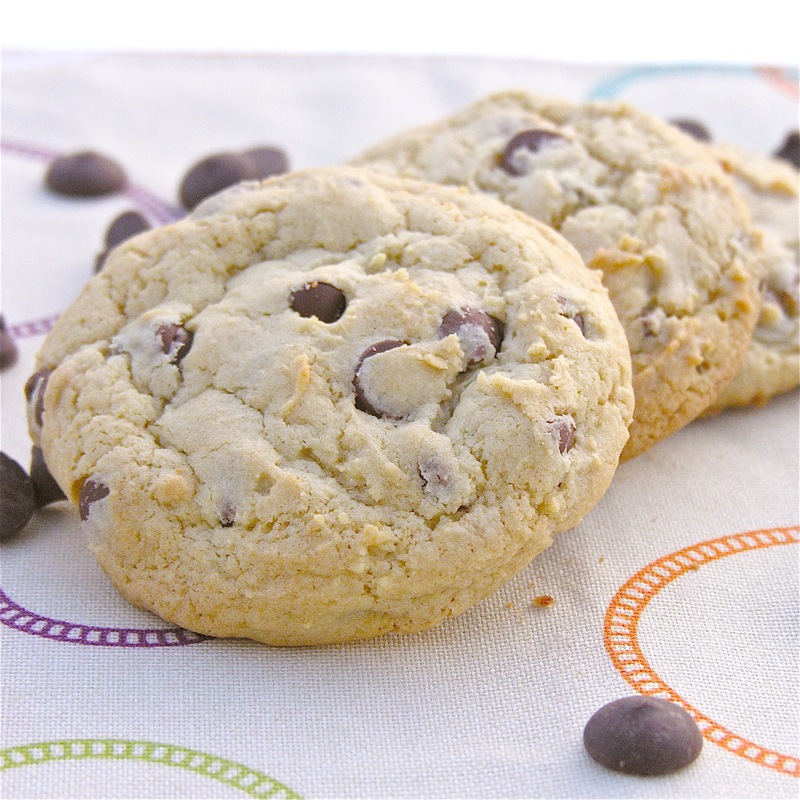 Thank you so much– I love them so much too- I never use any other recipe for chocolate chip cookies. My mom has frozen these and says they are fine. I’d guess a few weeks? I have frozen the caramel brownie recipe when it is made with mint– the brownie and the topping freeze GREAT- for several weeks- but I’ve not tried freezing the caramel…? If you do, will you let us know how it works out? I’m starting to feel like I should always pull a piece of each dessert I make and freeze it right then and there just to see. Sorry I can’t help you more…! Hi, I tried these yesterday and I really love the taste. But they wre not flat.so they do not have the perfect shape like on the pics. I must confess that I can not really work with cups so for the butter I used 240 g for one cup. Is this correct? Do you have any idea how come that they stayed round? Well, I just used a converter and got 225 grams per cup of butter. I don’t ever use butter in this recipe- I always use margarine, so that might have affected them. I also use a cookie scoop to portion my cookies out and that way they are all the same shape and size. I’ve found that the thickness of these cookies does vary. I think it has to do with the flour added– it seems when I have a drier dough the cookies stay more rounded, but when the dough is a little more moist they flatten out. Those are some thoughts– hope it helps! You’re so welcome!!! Hope they turn out perfect for you! Hi, I’ve just found your Blog tonight and am loving the recipes. Quick question – when you say 2c in the recipe, is that 2 cups? Also, do you use Plain Flour or Self Raising Flour for this recipe? I have a no-fail recipe for crunchy choc-chip cookies but a few people have said they like the soft chewy ones so will try your recipe soon. Yes, that is cups, and I use plain flour. Good luck– I really hope you enjoy them!!!! I think you are really going to like them…I’m thinking about making a batch this weekend too…cup of cocoa…chocolate chip cookie right from the oven….sounds like a perfect thing on such a cold day! Enjoy!! Well maybe we should swap places – it is all sunshine & beach here. Could do with some cold weather. Even in winter it doesn’t get cold here. Hi….quick question…on the baking soda, is that tsp or tbsp? This recipe can be a little fussy in that way- they always taste great, but sometimes flatten out. There are two things that can contribute to this: using butter instead of margarine, and not adding enough flour. I prefer butter in all of my baking, but butter just doesn’t work in this recipe. Use margarine. I used to use Fleishmans, but they changed it, so now I use country crock. As far as the flour- add it until its really not very sticky at all. You could *almost* roll it out into balls in your hands, but not quite. thanks for sharing this wonderful recipe. i love chocolate chips cookies! Learned about your link from a dear friend who also loves to bake. I drool over your pictures and I get so so excited. I am new baker. Just started baking last year. And enjoy doing such. for now, I will try your cookie recipe..the one that starts it all. you use tub of margarine? why not stick margarine? have you cooked with the stick of butter flavored Crisco? Ah..,,I’ve been asked those questions so many times! I generally use butter in my recipes- it’s SO much better than margarine- but in these particular cookies, margarine in a tub works best. I’ve made these cookies probably close to 100 times now and I’ve tried lots of variations, including shortening and sticks of both butter and margarine- the tubs work best…? I’m honestly not sure why? The cookies always taste GREAT, but with anything else they bake very flat and don’t have the thick cake-like consistency. I can’t wait try this new cookie recipe. so say margarine is better then real butter. For this recipe, yes-it is! Enjoy!! Oh I hope you love them as much as I do! They are SOOOO yummy- I makes me happy when others try them out!! I wonder why it was so runny for you? I know that happens to me when I use real butter, but if you used margarine…? I’m glad you experimented until they worked for you!! !